How To Add Page Numbers In Adobe PDF Documents? August 30, 2014 March 4, 2016 Vaibhav SComments Off on How To Add Page Numbers In Adobe PDF Documents? Undoubtedly page number in books or any other document that has piles of pages within it has its own special importance. The significance or the value lay not just in the real world but also in the virtual or the digital world of computers. Moreover when subject matter comes to [p2p type=”slug” value=”create-edit-pdfs-like-pro”]PDF[/p2p] (Portable Document Format) files, page numbers gain utmost value. The reason being that page numbers renders numerous valuable services in whichever document files they are put on. Hence, people usually search for various devises and look for tools that are a complete package of methods that illustrates as how to add page numbers in Adobe PDF documents that are stored on computer system. However, before acknowledging ways to apply page number to PDF pages in bulk, let’s learn what it is and also its chief importance in life of users. What is Page Number? – There exist several numbering schemes like chapter numbering in case of books. The chapters are numbered at three places in a book; one at the beginning of the book in contents, second at the beginning of chapters and thirdly at the end of book in index. Similarly, there exists other numbering scheme called page numbering which is also located at three places in case of books but in case of documents it is placed only at a single location on each page. It allows pages of documents to be compiled in a sequential manner. It stores in the ability to allow citing of a particular page and also facilitates readers to find out specific parts of the document easily and quickly. It helps in acknowledging the size of document by checking the page number of the last page. What Is Numbering Of Pages? It is a procedure in which sequential series of numbers is applied to pages either in books or other documents. The number applied is called the page number and it may be placed at any suitable location on the page. The spot can vary as per requirement such as at top or bottom of the page. At the top it can be placed at left, right or at middle. Similarly, on the bottom it may be put-on at the right, left or at the centre. Page number is also known as folio or bates and can be series of either letters or numerals. So, page numbers should not be mistaken for just numerals as it is most of the time. Visit the URL – http://www.sejda.com/. 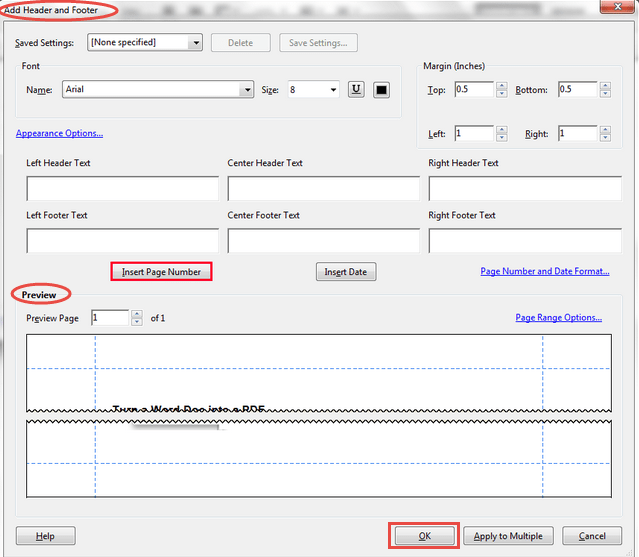 On the page click on link ‘Set Header and Footer on PDF’ to add page numbers where a new windows comes up. Click on tab ‘Upload local file’ to load a PDF file from the system shown in red color ellipse shape. Thereby, an option to choose file comes up on the screen. After selection the file gets uploaded with the name of the file, size and progress status report displayed as shown in the figure below. After that the tab ‘Done with files, continue’ shown in red color ellipse shape should be clicked upon. The next screen that comes up is the configuration screen where settings as per desire can be employed on the PDF pages of a document. The various options provided here are Header or Footer, Numbering Style, Font, Font Size, Alignment, etc. After defining all settings, the button ‘Start Processing’ rendered at the bottom of the page should be clicked upon. After some time the processing completes and the PDF file with page numbers added appears on the screen. 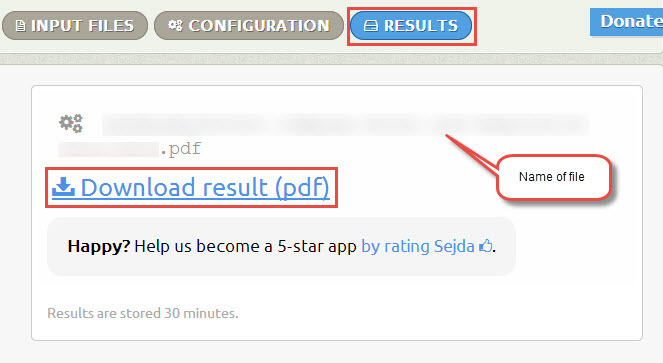 The link ‘Download result (PDF)’ can be clicked to acquire the file. Easily adds page numbers without complications and is not affected by any damage. It has option ‘Select from history’ that provides files to be added if selected before. The online tool is available free of cost. Only one document can be page numbered at a time. It provides a maximum of 50MB storage space. Open the PDF file to be page numbered in Adobe Acrobat. In, file toolbar click on Document. Then go to Header & Footer and then to Add. 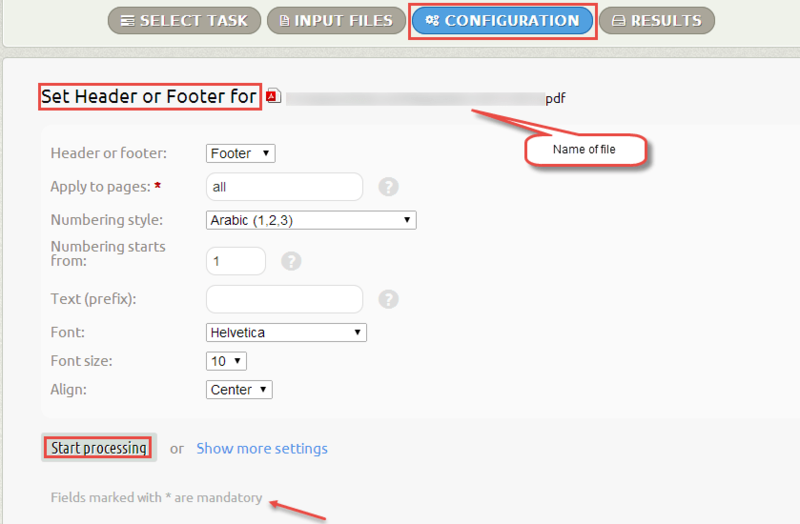 Thereby, “Add Header and Footer” screen as shown below pops up in which the option Insert Page Number should be clicked. Then cut the text (<<1>>) and fix in the box where page numbers have to be placed. Thereafter, the tab OK should be clicked on for the implementation to get over. File is not affected by any damage. At a time only one file can be page numbered. Adobe Acrobat license is essential. Process is a bit complicated as the page has to be cut manually. 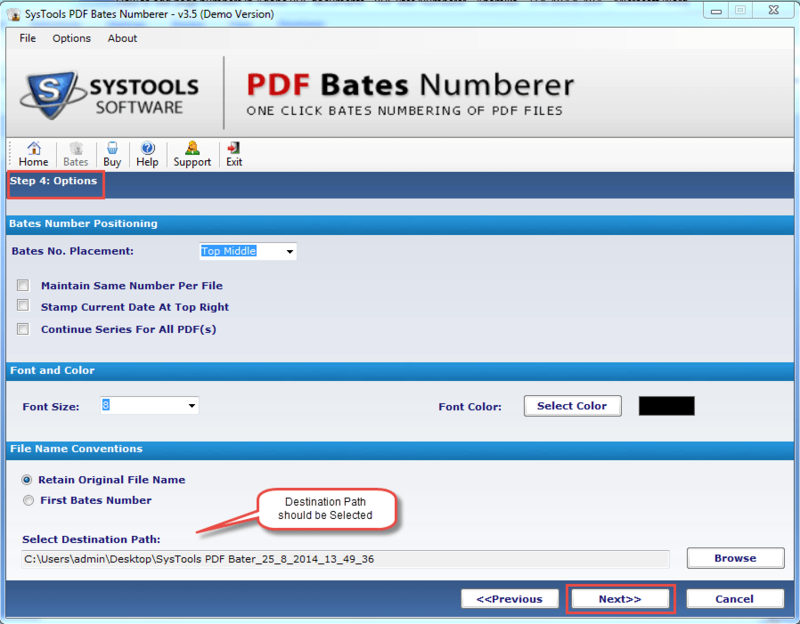 It is a third party application meant for adding page number to PDF files in batch. It is featured with many other advanced characteristics that make the tool users first choice. 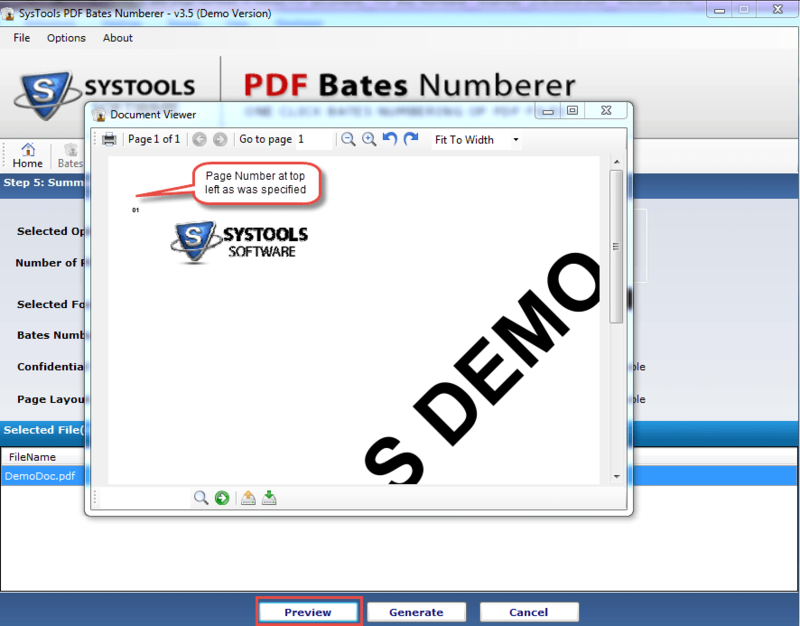 Visit this page: SysTools PDF Bates Numberer Software. Then download and install the software on any Windows machine. A screen will appear as shown below. Start the numbering process by clicking on tab ‘Bates’ at top left as shown in the in red color rectangular shape image below. Then a screen with three options as shown in the image below appears. 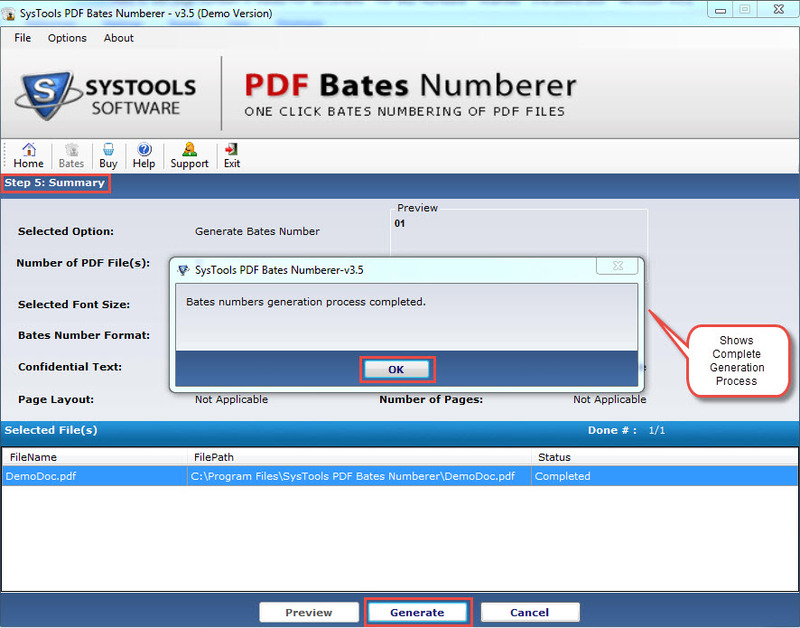 Any one out of the three alternative; Generate Bates Number, Generate Bates Number for File Series or Print PDF can be selected as per requirement. Then click tab Next. Then add either one PDF file or folder having number of files by clicking on button Add File(s) or Add Folder as per requirement. The tool also provides ‘Remove Encryption’ option so that even if the PDF is encrypted they can be numbered by putting a check mark in the box provided. Then, the button ‘Next’ should be clicked. A screen shot is shown below. Then another screen pops up where the details such as Bates Number Format, Additional Text, Additional Text Positioning, etc., as shown in the figure below. The details have to be specified where the field ‘Number of digit’ is essential. Then click on Next button. Then another window with various options such as Bates Numberer positioning, Font Size, Font Color, File Name Conventions and also Destination Path appears. The alternatives have to be provided for specification. On providing all the details ‘Next’ should be clicked on as shown in the figure below. Then a screen displaying the summary of the process pops up. At the bottom on the windows is a tab called Generate and the other is Preview. On clicking Preview, a small window showing the preview of the PDF file with added page number prompts up on the screen as shown in the figure below. On clicking Generate a small window as shown in the figure below prompts up showing bates numbers generation completion. Then the tab OK should be clicked upon to complete the procedure as shown in the figure below. 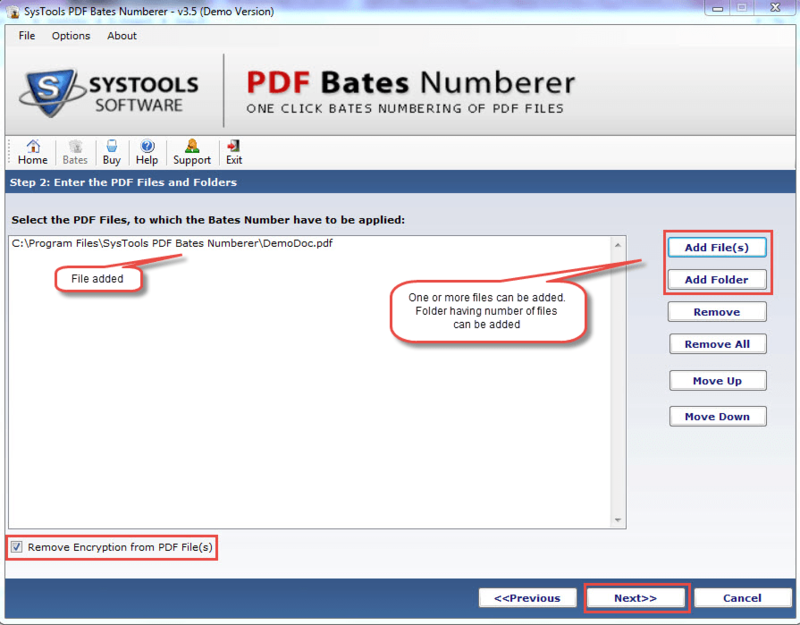 There is no limitation on the number of PDF files on whose pages, bates numbers can be added. Page number can be added to number of files at a time. Installation of Adobe Acrobat is not necessary. Removes encryption and adds page numbers. 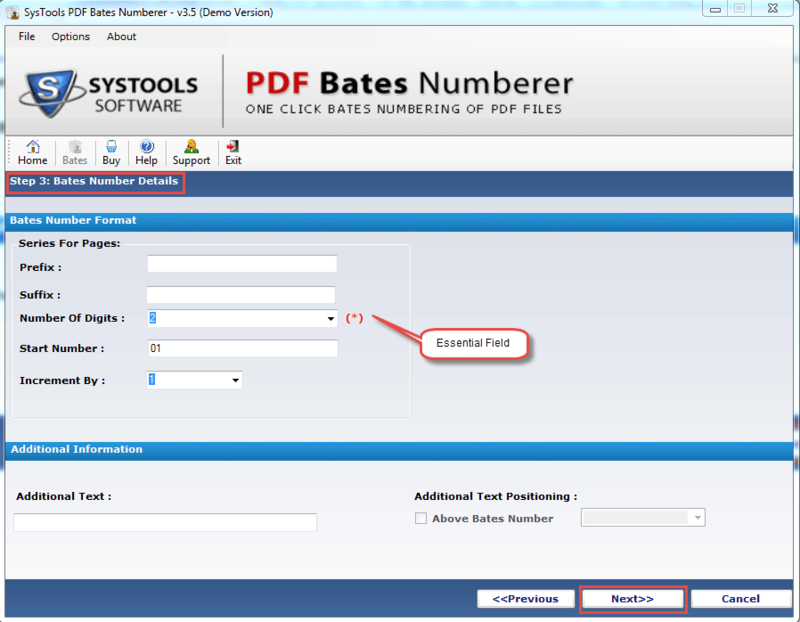 Allows adding Bates number and printing it on paper. The full version of the tool can be availed only on making a small investment. 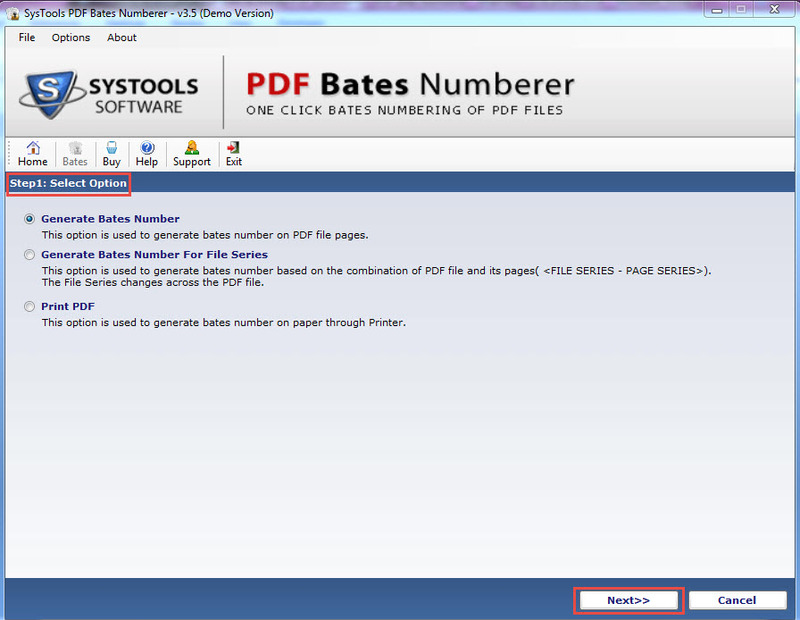 All the methods and tools discussed in the article can be used to add Bates number to PDF files. However, both advantages and disadvantages are associated with all the three. Users can use any of them depending on ease and requirement.